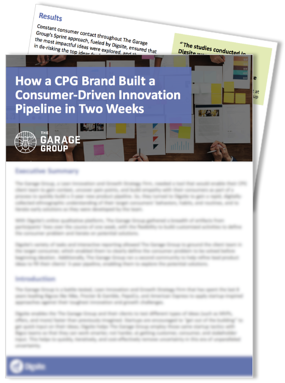 The Garage Group, a Lean Innovation and Growth Strategy Firm, needed a tool that would enable their CPG client team to gain context, uncover pain points, and build empathy with their consumers. So, they turned to Digsite to gain understanding of their target consumers’ behaviors, habits, and routines, and to iterate early solutions as they were developed by the team. With Digsite, The Garage Group is equipped with an affordable, rapid, iterative tool that allows them to better input into the strategic positioning and innovation pipeline decisions their clients need to make. Download the case study to see a full report of methodologies and key results.